Last week, our Etsy shop reopened and we started taking orders for our small business, once again! We had taken off some time through the holidays to enjoy our family and to also catch up on some behind-the-scenes work for the business, too. One of the things that I was working on during my holiday break was my mission statement for Anything Rustic. It took me many hours and a lot of soul searching to come up with this one paragraph; a single paragraph meant to capture the entire vision of my business. We are a small business and intend to stay that way, always. It is important to me that I stick to my roots and stay true to my own vision for my small business. This has meant having to say "no" to some offers that weren't a good fit for my vision, and at times, having to say "no" to myself when I notice that I'm drifting away from my purpose. This business was founded in 2015 as a way to keep me stay at home with my daughter, and also, as a way to let my creativity flow. With the help of my husband, we can make just about anything rustic; which is the main reason for our name, "Anything Rustic". Unbeknownst to some of those who try to follow in our footsteps and start their own business from home, I must say: we have jumped through a lot of hoops, done a lot of research and spent hours upon hours making sure our small business was registered as a legitimate business; Federally and also in our State. While we are a very small business, we operate and follow the same guidelines and government-mandated deadlines as any other business in our area. 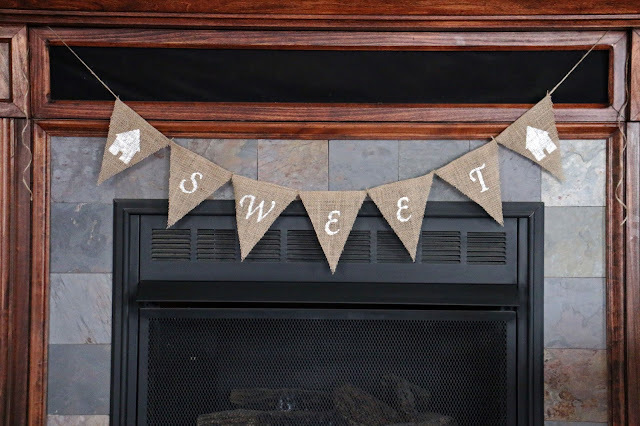 One of our top sellers is our handmade burlap banners, which I can often be found hand-crafting during my daughter's nap-time or after she's gone to bed for the night. We also offer some reclaimed wood items which aren't seen as much in my Etsy shop, but rather, showcased locally at craft shows and a local gift shop. We make rustic signs, furniture and one-of-a-kind lamps, too! We do hope to expand and feature more of our wood items online, as we come to find the most reasonable shipping methods to do so. That is a big goal of mine this year. I have a lot of goals for my business this year, the top goal being that I stay authentic to my own vision for "Anything Rustic" and to grow while still staying small. I would love it if you would consider signing up for our monthly newsletter. In it we plan to share our new arrivals, exclusive offers, specials, coupon codes and more. 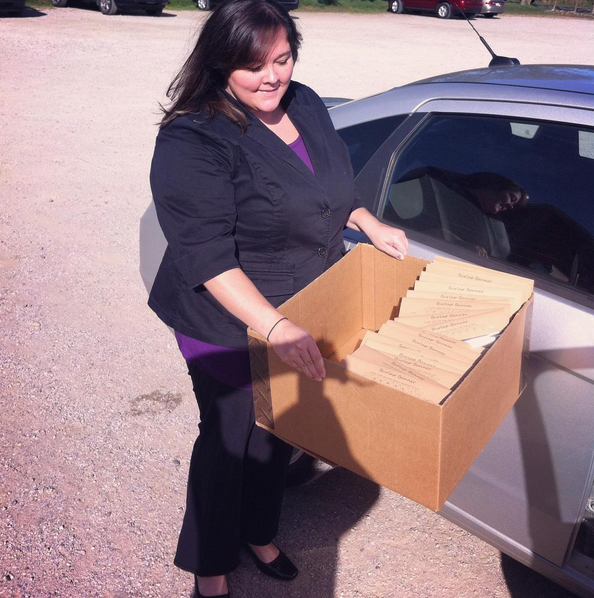 We don't like spam; we promise not to clog your inbox. Just one email a month, with a lot to offer! 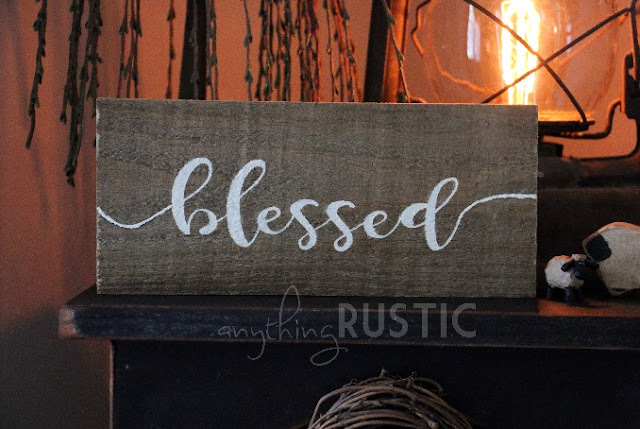 My husband, Nick, has been making my personal rustic decor dreams come true for years now. He is a handyman extraordinaire! Over the years, Nick has made countless rustic treasures for our family. He has made anything from reclaimed wood cabinets and rustic headboards to original light fixtures and scrap metal art. After receiving many requests for his talents to be shared with others, a little online store was formed. 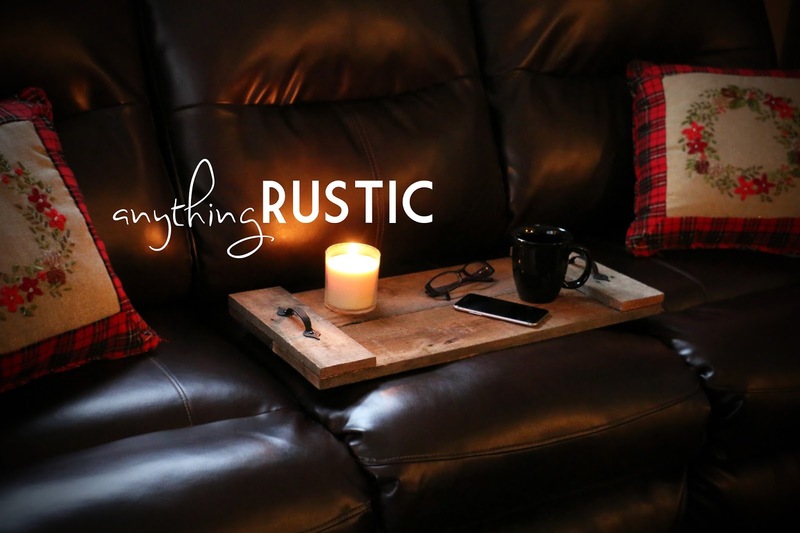 "Anything Rustic", an online Etsy shop, was formed sometime in 2014, however; we did not actively start selling items from our shop until mid-2015. At the beginning of 2015, two life-changing things happened to our family. 2. I left my career as a paralegal to stay at home with her. Along the way throughout new motherhood, I found myself missing the rewards of my past career, a job well done and all that jazz. 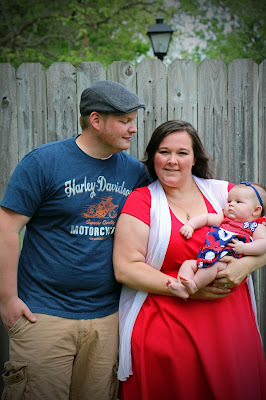 It was around June, 2015 when my husband, Nick, and I began to actively sell handmade items from our online Etsy shop, "Anything Rustic". Nick and I both enjoy designing and creating anything rustic and so came the name for the shop! Anything Rustic's Etsy store is a place where we can showcase both of our talents and share the product of our work with the world! One of the first items that became an instant hit in our online shop was our line of handmade burlap banners. 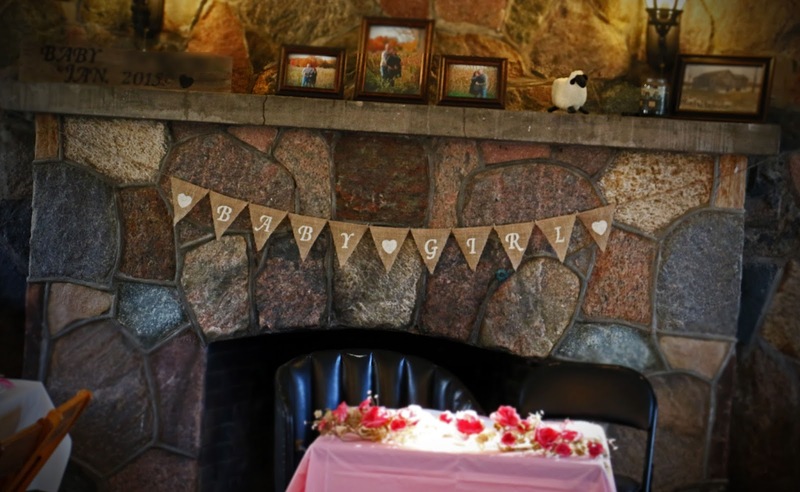 We got the idea to make and sell burlap banners back when we were making our own decorations for my baby shower last year. I wanted a "baby girl" burlap banner and I knew we could make it ourselves. Wouldn't you know it, the "baby girl" banner quickly became one of the top sellers and was the first banner sale in our online shop! How sweet is that? Only three months after selling our very first banner online, we were given the amazing opportunity to sell our handmade burlap banners locally at "The Light in the Woods" art and gift shop in Edinboro, PA! "The Light in the Woods" is a local art and gift shop that specializes in unique and hand-crafted pieces by local artisans. The space that the owner, Jessica, has made for her shop is beyond description. When you walk into "The Light in the Woods" you are surrounded by such beautiful pieces. Her quaint and tranquil shop is one of my new local favorites (and not just because my banners are available there, trust me). Shopping at "The Light in the Woods" is an experience that you'll remember! 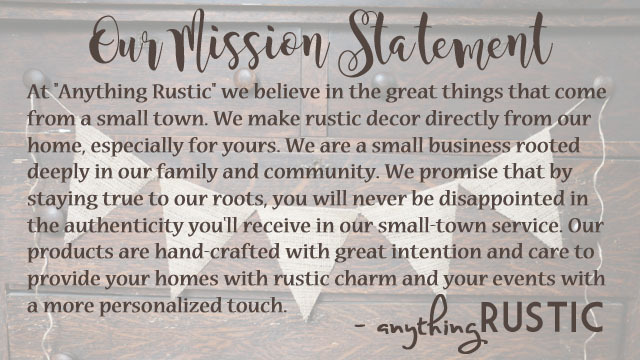 This is the story of "how it all started" -- I hope to include more stories of our success with "Anything Rustic" along the way. 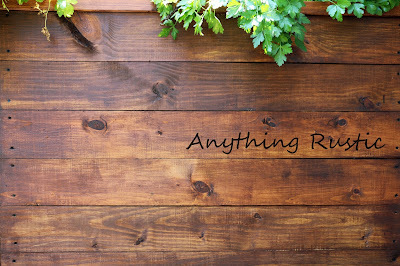 Welcome to the blog for our Etsy shop, "Anything Rustic". We are so glad you found us! This shop is a real dream come true for us. My husband, Nick, and I love anything rustic, and so came the name for our shop! For many years, Nick has been making my rustic dreams come true, and now with this shop, we can do the same for you! Send us your Custom Order Request, today! We'd love to help make your rustic dreams come true.